Churu is a city in the desert region of Rajasthan state of India. It is known as gateway to the Thar Desert of Rajasthan. It is the administrative headquarters of Churu District. It lies in the Thar Desert on the National Highway-65 connecting Pali to Ambala and is a junction station on the railway line to Bikaner. It is near the shifting sand dunes of the Thar Desert and has grand havelis with marvelous fresco paintings, namely Kanhaiya lal Bagla ki Haweli and Surana Haweli, with hundreds of small windows. It also has some fine Chhatris. Near the town is a religious seat of the Nath sect of Sadhus where there are life-size marble statued of their deities and a place for prayers. There stands a Dharam Stup, a symbol of religious equality. At the centre of the town is a fort built about 400 years ago. 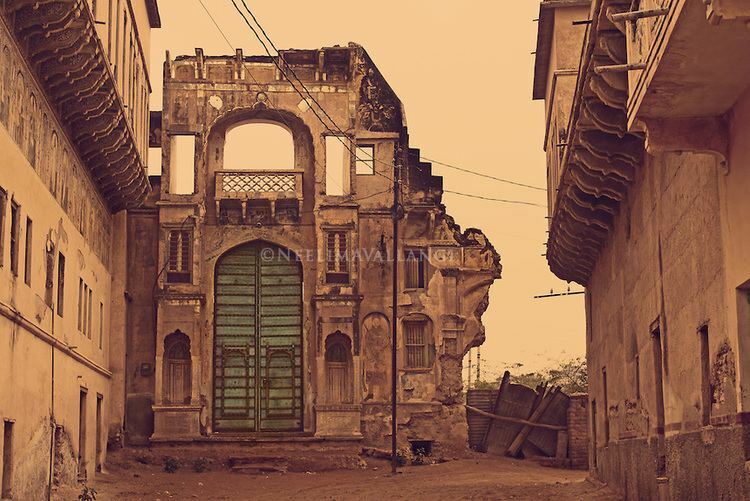 Founded in A.D. 1620 by Chuharu Jat at Nirban Clan of Rajputs and the place was named Churu after Choru Jat's name in the Jangladesh region of the state. It was subsequently ruled by Rathore Rajputs and during war of 1871 the area came under dominance of Bikaner. Churu, like an oasis, situated in the middle of the shifting golden sand dunes, opens the gate to the great desert of Thar. Geographically, it lies in 28°18′N latitude and 74°58′E longitude. Administratively, it is the headquarters of the Churu District. 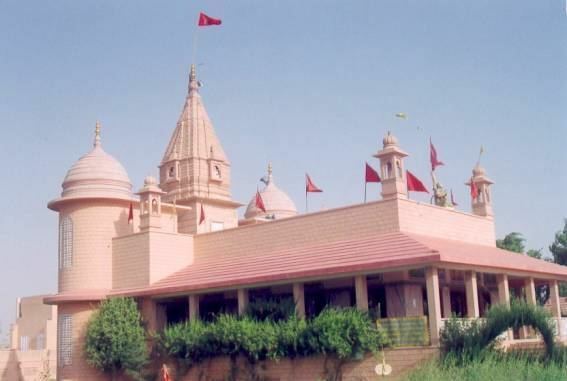 The temples of Salasar Balaji and Babosa Maharaj Churu, Dadrewa the birthplace of Goga Ji and Baba Phoolnath Temple NAWA are situated in the Churu district. Before India's independence in 1947, it was a part of Bikaner State. The district came into existence in 1948 comprising three tehsils Churu, Rajgarh and Taranagar when the administration of Bikaner State was reorganized. – now there are six tehsild, comprising Churu, Sadulpur, Ratangarh, Sujangarh, Sardarsahar and Taranagar. As About 6 tehsils lies under Churu district (Taranagar, Sardarshehar, Rajgarh, Rattangarh, Sujangarh, Bidasar (new)) with more than 900 villages along with 248 panchayats and about 20 lac population, the economy of the town and surrounding area is mainly based on animal husbandry and hand embroidery work done by women. Due to climatic conditions, the scope of agriculture is very low in Churu. Also, more than 2 lac women do hand embroidery in Churu district itself. They tie designs on the cloth by the help of needle and nylon threads. After the cloth is coloured they again tie the knots on the cloth and finally again with the help of needle, thread and different types of beads, sitaras, mirror, pearls, and stitches they do the hand embroidery work on the coloured tie dyed fabric which makes the stuff much more decorative. The embroidery work depends on the sale price of the bandhani and the demand of the market. Many small suppliers depend on the women working here. These suppliers finally collect the fabric and deliver to the big wholesalers, retailers and exporters. These big people fetch a good price from the consumer only because the odani/bandhani/chunni they are selling is 100% hand made. But the women working hard behind this process are earning very little. Due to lack of water or hard water Agriculture is very tough in villages of Churu. The farmers are totally dependent on rainwater. The main source of income of the people living in rural villages of Churu are from dairy, but they cannot earn much from this because they have no money to increase the milking animals. Women here help and support their families a lot by working 5–7 hours a day by doing hand embroidery Work on the fabric/bandhani/odani cloth.These women earn around Rs60–70 per day which makes approximately 2000 rs per month by a single woman and on an average there are 2 women in each of the houses. Churu has a small mandi (market) for few agricultural produce of the area. The town has a Krishi Upaj Mandi Samiti (Agricultural Produce Market Committee) . The Food Corporation of India has its warehouses in Churu. The town is the main supply point for surrounding villages. There is no medium or large size industry in the industrial area. The very few small-scale industries are granite slabs and tiles, cutting and polishing, and mustard seed crushing.This results in unemployment in the district. The city is organized around the main area of the city name Kalera Bass surrounding areas of Chandani Chowk, Adarsh Nagar, Balmiki Basti, Mochiwarah, Vanvihar Colony, Naya Bass, Subhash Chowk, Nai Sarak, white clock tower, ≥dharma stupa≤ etc. 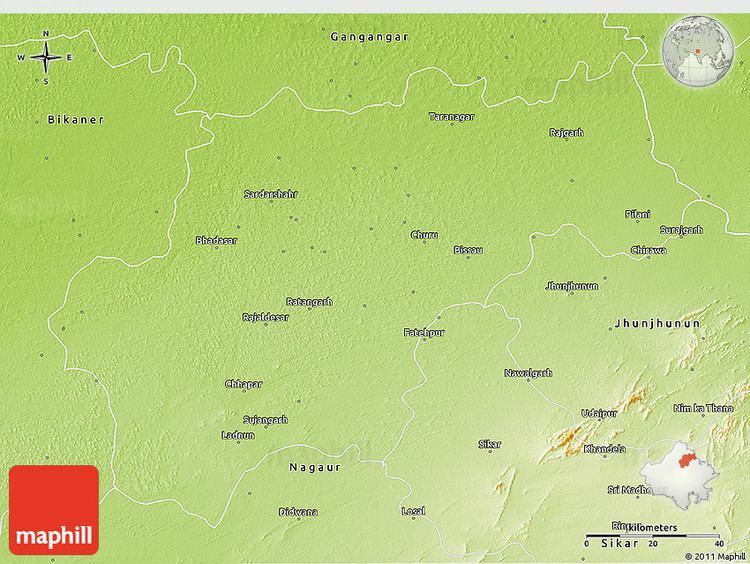 Churu is located at 28.30°N 74.95°E﻿ / 28.30; 74.95. It has an average elevation of 292 m (958 ft). 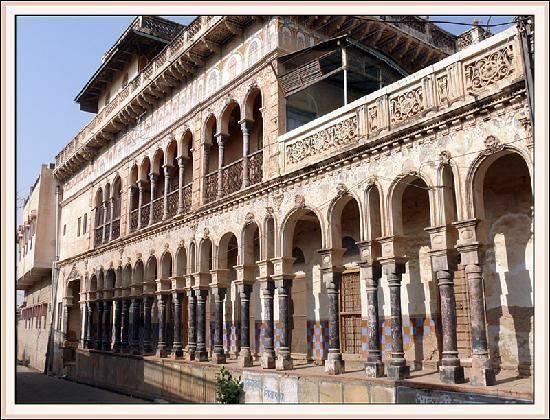 Churu is a district with an enchanting topography amidst the Thar Desert. The Churu City is encircled by large shifting sand dunes. The area is scanty in vegetation. Phoge and Kair bushes and Khejri/Khejra (Prosopis cineraria), Royara and Babul trees are to be mainly found on the sand dunes. In the towns, neem and peepal and siras trees can also be noticed. One can find sand dunes all over the area with a couple of small limestone hills. The region boasts record temperatures ranging from below freezing point in the winters to over 55 degrees in the summer afternoons. Before dawn in the months of December and January one may not be surprised to notice ice in small waterpots or frozen water dews on the little vegetation. Yet one may find that summer nights are cooler and winter days are warmer. There is a great variation in minimum and the maximum temperature of Churu. As of 2001 India census, Churu had a population of 97,627. Males constitute 52% of the population and females 48%. Churu has an average literacy rate of 62%, higher than the national average of 59.5%: male literacy is 72% and, female literacy is 51%. In Churu, 17% of the population is under 6 years of age. As per provisional reports of Census India, population of Churu in 2011 is 119,846; of which male and female are 61,771 and 58,075 respectively. Although Churu city has population of 119,846; its urban / metropolitan population is 120,147 of which 61,936 are males and 58,211 are females. Transport Churu is a junction station on Delhi-Rewari-Bikaner.The DEE BKN S F EX train that run between Delhi to-Bikaner via Churu. broad Gauge railway line and also connected to Jaipur via Sikar. The railway track to Jaipur are meter gauge and is being converted to broad gauge. Churu lies on NH 65 and is connected to all major cities by all-weather roads. There is one sub grid station of 220 KV at Churu itself. The town receives power from Power Grid Corporation of India's grid station in Hissar, Haryana. Almost all villages of the Churu sub division are electrified. The town gets drinking water from local wells which is hard and brackish. The town area drinking water supply is managed by water dept. of Government of Rajasthan. The Government is trying to get drinking water for the area from Indira Canal. The main source of irrigation for farmers continues to be rain water and wells at a few places. Safe Water Network India in association with Bhoruka Charitable Trust has augmented natural water storage at homes through Rooftop Rain Water Harvesting by creating household kunds (970) and has also refurbished existing community kunds (40) to provide water to families living in huts and children in schools. This initiative has reduced the drudgery of women and the girl child in this water-challenged region of Rajasthan. The town has a post-graduate college (Lohia College) affiliated to University of Bikaner, Balika Mahavidalya and Government Law College, also affiliated to Maharaja Ganga Singh University. There are several higher secondary, secondary and primary schools in Churu. Major schools of Churu are: Kendriya Vidyalaya , Lords International School (http://lordschuru.in/) Little Flower School, Shri Jain Swetambar Terapanthi Sen Sec School, The Walden Pond Sr. Sec. School, Lakshmipat Singhania Academy, Adarsh Vidya Mandir, Montessori School, Goenka School and Bagla senior secondary school the oldest of Shekhawati region by Bhagwandas Bagla.BRJD Public School Nyangal[BHORUGRAM] Rajgarh is also famous school managed by Bhoruka trust. There are a few NGOs in the town. Navyuvak Mandal Mithi Redu, Manav Pragati Sansthan, rihai, Prayas Sansthan, Marudhar Yuva Sansthan, Dudhwa Mitha, etc. are famous NGOs. Churu has good medical facilities. The town has a government hospital (Bharatiya) which has very good medical facilities and a few private hospitals like the Hirawat Heart Care Center and Bhanu Hospital. There is an Ayurvedic hospital, too. The town has a sports stadium. It has indoor and outdoor games facilities. The yearly state-level tournaments can be held here. Adventure sports like Parasailing, Paramotoring, Rappelling are also conducted in Churu by Youth Adventure Sports Institute. Many nationalised banks State Bank of Bikaner & Jaipur, Punjab National Bank, Bank of Baroda, Rajasthan Bank, State Bank of India, ICICI, HDFC and some other banks have branches here. Some co-operative banks (Churu Central Cooperative Bank and Bhumi Vikas Bank) also have branches in the town. The town has a public library managed by the government named Shri Sagar Jain Jila Pustkalaya. Mohar Singh Rathore, Social Reformer and Notable MLA & MP of Churu. Kishan Singh Rathore, one of the first recipients of the Mahavir Chakra, he belongs to Ghadsisar village near Sardarshahar, Churu. Bhanwarlal Sharma, member of Legislative Assembly, Churu.